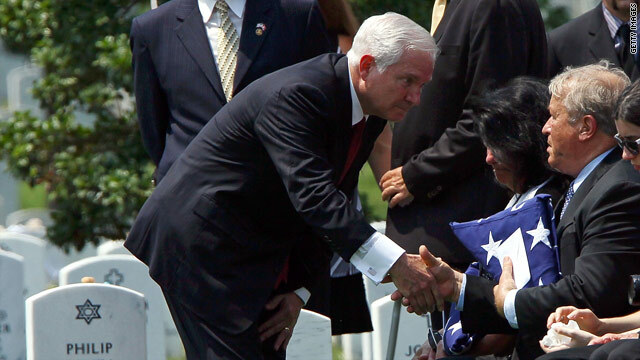 Defense Secretary Robert Gates on Thursday consoles the family of Army Pfc. David T. Miller, who was killed in Afghanistan. For details on U.S. casualties in Afghanistan and Iraq, go to CNN.com's special report, Home and Away. Kabul, Afghanistan (CNN) -- Six U.S. service members were killed in southern Afghanistan in the past two days, the NATO-led command said, making the death toll in July the deadliest month for American forces since the war in Afghanistan started nine years ago. Their deaths bring the July tally to 66. A total of 88 international service members, including Americans, have died this month. It is no coincidence that IEDs caused most of the latest deaths. Taliban militants regularly target troops with improvised explosive devices. The homemade bombs are considered the weapon of choice for insurgents in the Afghan conflict. The military regularly conducts raids targeting those who stage the attacks against troops. The latest grim milestone comes amid growing frustration among U.S. citizens over Washington's strategy in the Afghanistan war, the leak of thousands of secret documents about the war, and the dismissal of Gen. Stanley McChrystal as the top military commander. McChrystal stepped aside over inappropriate comments he made about some officials in the administration. Gen. David Petraeus took over the role. Coalition forces have intensified their war against insurgents, and militants have been tenacious in targeting U.S. and Afghan forces and those Afghans who participate in the political system. ISAF reported that a motorcycle rigged with explosives in Kandahar detonated outside the home of a parliamentary candidate on Friday, killing a woman and a girl. The bombing occurred when the candidate left his house but he was not injured. On Thursday, the son of an election campaign chief for a parliamentary candidate and another civilian died in an insurgent ambush, ISAF said. ISAF also said Friday that insurgents killed 13 Afghan civilians Friday. Coalition and Afghan forces have worked to apprehend people behind such attacks. Over the last 24 hours, troops detained insurgents in Helmand, Khost, and Paktiya provinces. A commander for the Haqqani network, an operation with links to al Qaeda, was seized in Paktiya. Discord that flared in Kabul on Friday illustrated the tensions between Afghans and Americans. Scores of people rioted in Kabul after a vehicle carrying four U.S. contractors was involved in an accident with a car carrying four Afghans. "The U.S. contract personnel cooperated immediately with local Afghan Security Forces ... who were on the scene and dealing with the situation. Our sympathies go out to the families of those Afghans injured or killed in this tragic accident," the embassy said. Approximately 75,000 pages of documents posted on Sunday by the whistle-blower website WikiLeaks has highlighted the challenges in fighting the war. The reports document attacks on U.S. troops and their responses, relations between Americans in the field and their Afghan allies, intramural squabbles among Afghan civilians and security forces, and concerns about neighboring Pakistan's ties to the Taliban. Adm. Mike Mullen, the chairman of the Joint Chiefs of Staff, and Secretary of Defense Robert Gates both criticized the leaks. "The sheer size and scope of the collection now demands a careful review to determine the degree to which future tactical operations may be impacted and the degree to which the lives of our troops and Afghan partners may be at risk. And I think we always need to be mindful of the unknown potential for damage in any particular document that we handle," Mullen said. Afghan President Hamid Karzai and U.S. military officials are angry that names of Afghans helping the coalition are in the documents. "This indeed is very irresponsible and shocking," Karzai told reporters Thursday. President Barack Obama has announced plans to send 30,000 more U.S. troops, but has said he will start withdrawing American forces in July 2011. Before this month, June was the deadliest month for Americans and coalition forces. A total of 103 international soldiers died last month -- including 60 Americans. The totals are based on reports compiled by CNN.